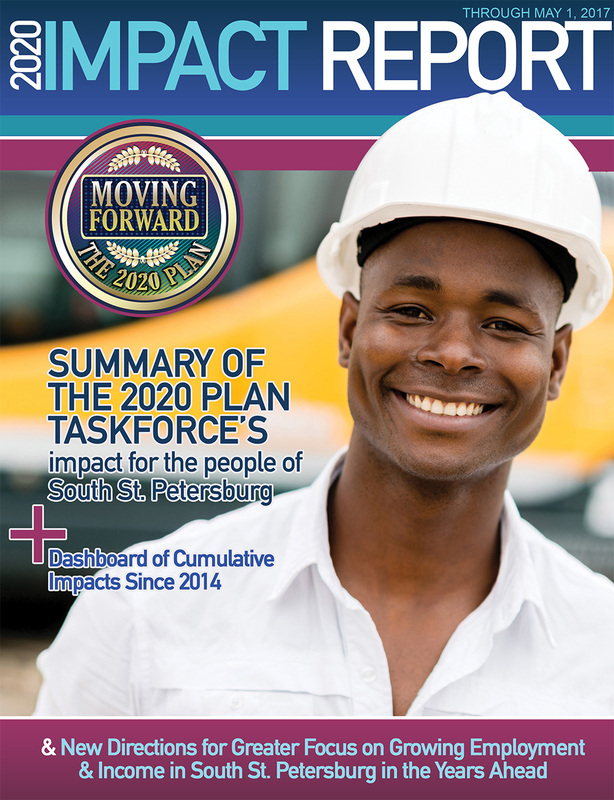 This annual impact report o ers a snapshot of impact resulting from the collective work of 100+ organizations since January 1, 2014 toward the 2020 Plan goal to reduce poverty by 30% in South St. Petersburg. The results covered in this report are the product of people from every sector of our community who contributed time, talent and treasure to the actions needed to accelerate poverty reduction. We o er special thanks to partners who had a foundational impact toward the 2020 vision over this past year since our previous annual report. They include Allegany Franciscan Ministries, the City of St. Petersburg, Bon Secours Health Systems, the Tampa Bay Black Business Investment Corporation, Mt Zion Progressive Missionary Baptist Church, the St. Petersburg Area Chamber of Commerce, Pinellas Opportunity Council, the Pinellas County Urban League (2020’s scal agent and service partner), and St. Petersburg College (host of 2020’s o ce and service partner).